Cool stylish short buzz curly haircut for guys! If you are looking for a fashion short cut, this silver hairstyle is for you. This haircut is commonly referred to as a tight taper. 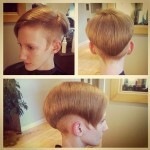 The hair is clipped to a 1 1/2 blade on the sides and back of the head and then tapered into the length on top. The short buzz cut is not always boring, you can add curls! Just like Chris Brown here. Chris Brown loves to dyed his hair in different colors, just like blue, red, white etc, here he dyed his black hair silver, and add some stylish cool small curls in the front. Pomade adds shine, control, and texture. Have you noticed Chris Brown’s tattoo on his neck? It’s awesome! I love it so much!